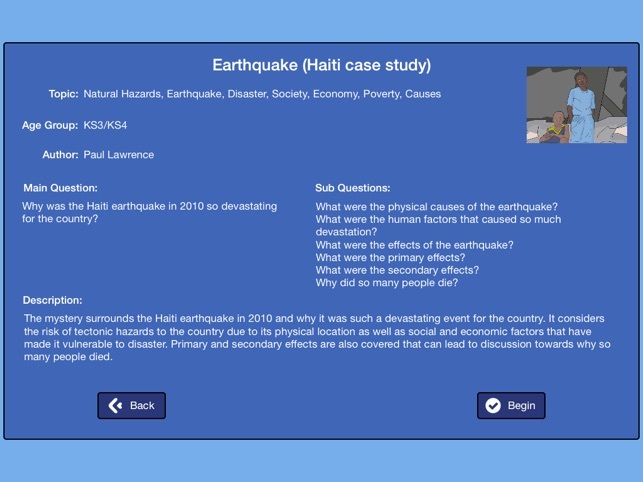 Digital Mysteries: Earthquake (Haiti case study) is a unique app in allowing pairs of 11-16 year olds to work simultaneously on one iPad with a task designed to encourage discussion and higher-level thinking around the geography curriculum. 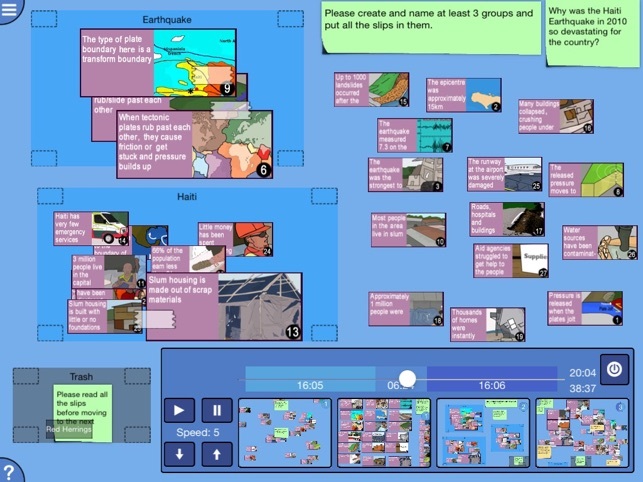 The process users go through is based on the popular paper tool 'Mysteries', created by Professor David Leat and the Thinking Through Geography team in the 1990s. 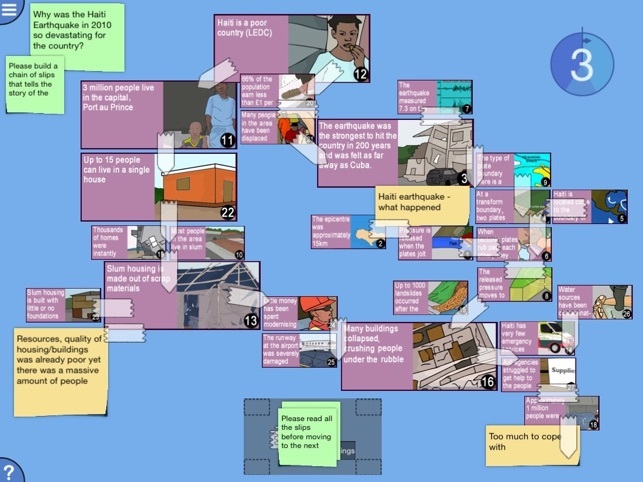 Users are given illustrated slips of information on the Haiti earthquake in 2010 and asked why it was so devastating for the country. The task considers the risk of tectonic hazards to the country due to its physical location as well as social and economic factors that have made it vulnerable to disaster. Primary and secondary effects are also covered that can lead to discussion towards why so many people died. There are 33 slips on hard level, 27 on medium and 19 on easy. These include facts on earthquakes, Haiti and its capital (as well as the aftermath). It can be used as a GCSE case study but also to explore the topic at KS3 too. 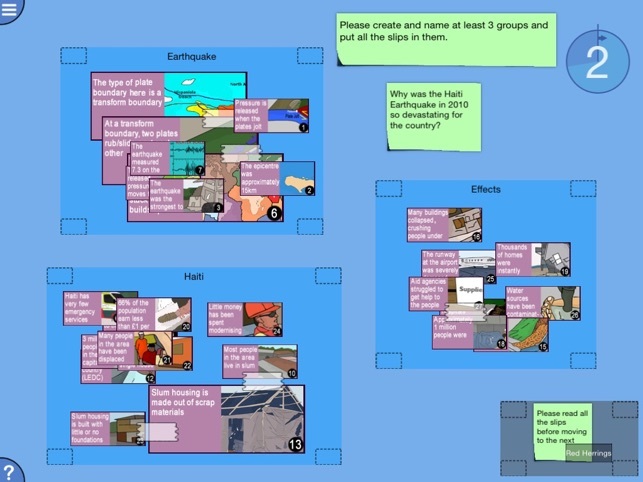 Before or after using the mystery, students could research the earthquake so they can bring their own existing knowledge into their answer. Students must read all the slips, organise them into groups and then sequence them to represent their thought pattern in coming to an answer. A PDF report is generated which can be printed off or shared as a record of learning. Students can also go through the Reflection Stage in which they can playback the process and reflect on their ideas. There are extras to the task including suggested sub-questions for teachers to ask, as well as possible learning outcomes. 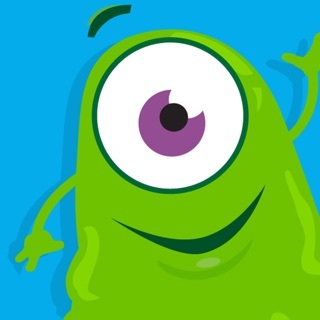 This app works well with those aged 11-16 (KS3/KS4) – it can be used as a GCSE case study or as a way of introducing the topic to KS3. By having three difficulty levels, it supports differentiation in class and can be suited to varying abilities/levels of knowledge. As the difficulty level goes up, more slips are added which bring in more complex information or strands to the topic. At the bottom of the app details tab, tap ‘Developer Apps’ to view our current range. 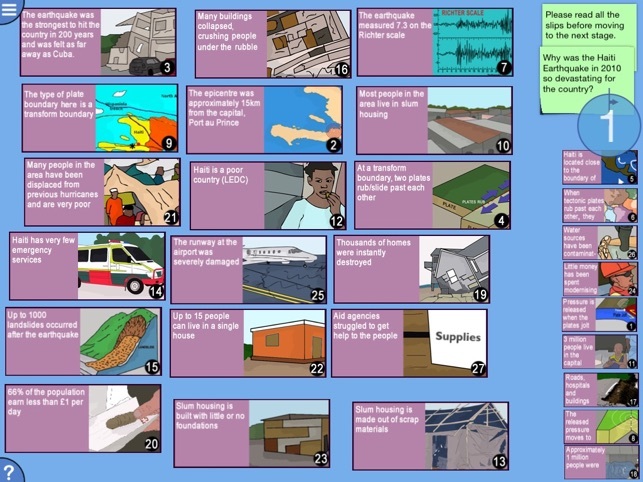 Many more Geography tasks are available.